In December, I said I’d post some more video and that got a few ‘thumbs up’ so here it is. The quality isn’t great because the file size has to be greatly reduced to upload on here but it will give you a short overview of the place where Georgiana Molloy was born in 1805. I’m kept aware of the wide geographical range of readers through the messages I receive from far and wide – as well as near to home! I know it’s of most interest to see places that you can’t usually visit yourself so I try to keep a balance between photographs of the areas where Georgiana lived in England/Scotland and those that were significant to her here in Western Australia. Some have changed more than others. Some places are more difficult to photograph because of changes due to modern development. I was reminded recently by a reader in France (hello, Annette!) that I haven’t posted many photographs of the Vasse/Busselton region where Georgiana lived after she left Augusta. We’re planning an expedition soon to sort that out and I’m looking forward to revisiting some special places in the northern part of the Capes to capture those views for you, so watch out for some new photographs soon. The 12th Century cathedral where Georgiana and many of her ancestors were baptised and where her parents were married. It was built from local red sandstone that weathers very easily, the same reason why inscriptions on so many headstones I’ve looked at there have worn away completely. The ruins of the Medieval abbey, just a few steps from Georgiana’s home. The castle, built by Georgiana’s 20 x great-grandfather, a son of William the Conqueror. The square, stone setts still used as the surface on Abbey Street. 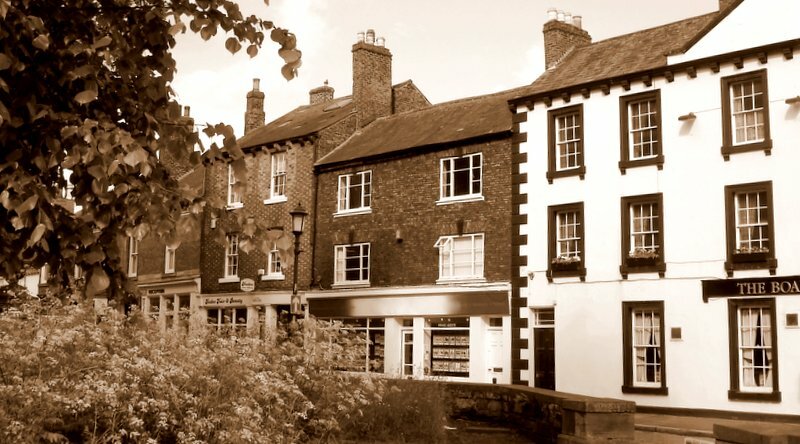 You’ll also see three houses built by her grandfather George Dalton, a mayor of Carlisle, the market square that was used as the centre of trade when she lived there, and the West Walls, one side of the original fortifications of the old city with a cart track (then) and a road (now) along them. And you might spot Mike Rumble making two or three very quick appearances! My fellow-researcher and travelling companion for fifteen years and husband for many more than that, he goes far beyond the call of matrimonial duty to get great photos for me to post on my websites and Facebook pages and he took most of the photographs in my book, Georgiana Molloy, the Mind That Shines. I knew a little, very little, about Georgiana Molloy. And then last year I heard about the book and her life’s work in Western Australia, which in her time must have seemed the remotest place on earth. What an amazing lady, what a story of hardship, heartbreak and triumph.. its rather poignant seeing where she was born, lived as part of a real family and knowing that she would not return. I couldn’t do it.i visit Vasse and surrounds a couple of times each year and the moment I pass Georgiana Molloy Anglican School she is at the forefront of my thoughts. Thanks so much for taking the time to write this comment, Warren. I feel just the same, that contrast between there and here, and the knowledge that she would probably never see her UK family again – even though the original plan was to stay here for a few years and then return. But the loss of a home that held with it centuries of ancestry, to arrive here and live first in a tent and then in a thatched cottage. As you say, a poignant story. I’ll be posting more video over the next few months.